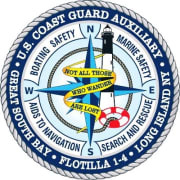 Our Flotilla (I.E local unit) is mainly based out of Lindenhurst, but is comprised of nearly 100 members from all over Long Island. The Auxiliary has something for everyone. Our volunteers are all ages and put in as much time as they like. The more you put in the more rewarding volunteering in the Auxiliary becomes! Members do not have to own boats or even have an interest in ever being on the water. There are many ways you can volunteer and make a difference. Whether you're interested in public education, public affairs, boating, search and rescue, administrative duties, or just being part of Homeland Security we have something for you. If you're interested in joining you can call 631-683-USCG and someone will return your call.